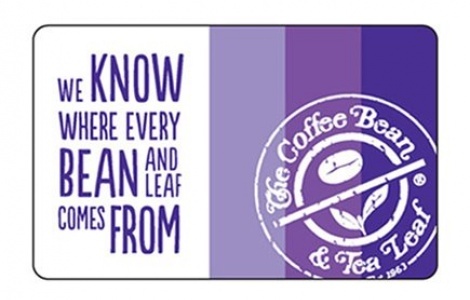 The Coffee Bean® Card is redeemable for merchandise, food and beverages only at participating U.S. locations or coffeebean.com. This card is not redeemable for cash unless required by law. Lost, stolen or damaged cards will only be replaced if an original sales receipt is provided. Replacement value will be the value of the card at the time you report loss, theft or unauthorized use. Use of the card constitutes acceptance of these terms and conditions. For more information, call 1.800.832.5323. Gift cards purchased internationally cannot be used in the United States or on coffeebean.com.